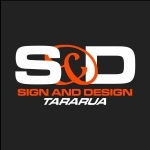 Sign and Design Tararua is your destination for all of your sign writing needs. We're a Dannevirke based company specialising in designing and producing signs of all shapes and sizes, we also do custom printing, detail sandblasting and promotional products. Do you need a new shop front sign? We can do that for you. Have a design sorted but need some new signage? Easy as! Need business signage for your commercial vehicle? We've got it covered! Roadside signage for your business? We can tell your customers where to go. A local business for nearly a decade, we know what works around here. From safety signs to bumper stickers, shipping labels to window signs, with our cutting edge technology we can design and make what you need. Eye catching and durable signage with expert advice and 22 years of design experience, if you know what you want, we can make it for you. If you don't know what you want, we can probably help with that too.